A storm is making its way across New Jersey from South to North this week and is expected to cause heavy rain and snow throughout the state. Residents can expect to see one to two inches of snow during this storm. These rain and snow storms may be the result of a nor’easter, which will also cause freezing temperatures that residents will need to be prepared to endure. The nor’easter is undergoing a bombogenesis, which is when a low pressure system falls 24 millibars in 24 hours. When a storm does this it is known as a bomb cyclone. A storm of this magnitude is not to be taken lightly, because of the intense weather patterns it can cause over a large area in a short amount of time. The snow this wind storm creates is usually wet, making it likely to cause widespread rain damage throughout New Jersey. It is important for home and business owners to take the necessary precautions before the brunt of the storm hits if your home or business is in line to get caught in the bomb cyclone. Nor’easters and bomb cyclones go hand in hand, which isn’t the best news for property owners living in New Jersey. To prevent wind, snow and rain damage on your property and stay safe during a storm of this magnitude, there are some steps you can take to prepare your home or business against its effects. You should secure any outdoor patio furniture, trash cans or lawn ornaments. If you can, bring them inside your garage. These items can be swept away by the powerful winds and flooding. Since this storm will cause strong winds, you should cover your windows with a strong covering. Storm shutters are ideal, but if you do not have any then you can board up your windows with marine plywood. Flooding may occur during the storm, and if it does, your basement will be one of the most heavily affected areas. If you keep items down there, elevate them and bring any important items upstairs. Make sure your sump pump is working, and if you do not own one, buy one. Listen to the media throughout the storm to find out if your are instructed to turn off your gas and electricity. Make sure you know where the main power switch is located ahead of time. Staying safe is the most important part of preparing for any storm, and the best way you can do this is by staying inside throughout its duration. The flooding and strong winds will make driving exceptionally difficult, so staying off the road is of the utmost importance. However, there may come a time where you are asked to evacuate your home, which will require you to go into the storm. Only take essentials with you, including your pets. Remember to stay away from flowing water. It may not seem like it, but six inches of moving water can easily knock you down. If you are in your car, drive away from flooded areas. Two feet of moving water can sweep your car off away. If you become trapped in your car out in the snow storm do not get out of the vehicle. Only go on top of your car’s roof if water begins rising inside the vehicle. At that point, contact emergency rescue teams, such as the local police, FEMA or The Red Cross, and wait until help arrives. 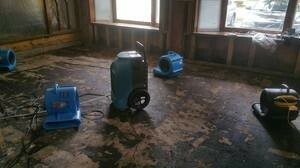 Water Damage New Jersey: Are You Really Prepared for Storms?